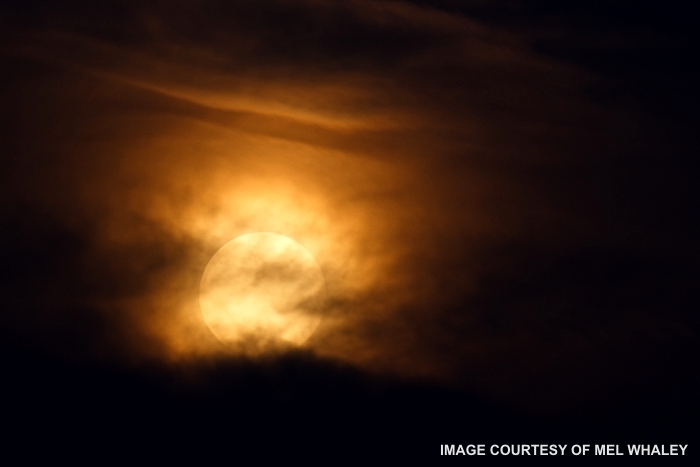 Answer: The short answer is … the color is caused by Earth’s atmosphere, and has nothing to do with the Moon itself. You can see the same effect when the Sun rises, or for that matter, when the Sun or Moon sets. When any celestial object is close to the horizon, its light has to pass through a lot more air before it gets to your eyes. The density of air decreases as altitude increases. So when a celestial object is at the zenith (directly overhead), its light is taking the shortest path through the atmosphere to your eyes. That distance is about 60 miles, and that amount of air is defined as one standard air mass (AM1). Compared to AM1, the amount of air light must traverse when you look toward the horizon is ≈ 38 times greater (AM38). The distance isn’t 38 times greater, but denser air near the ground makes it optically equivalent to 38 times more air. The photo above was taken by Mel Whaley of Surprise, Arizona, who graciously allowed me to use the image. It nicely shows the effect you asked about. As you can see, it was cloudy that night, but you don’t need clouds to get the orange colors. All you need is to have the object close to the horizon. I wrote about this in my July 11, 2011 Sky Lights. That blog was about orange sunsets, but the same principles apply. Check it out for a great explanatory diagram. Here in Arizona, especially if it’s been windy, we get a lot of fine dust floating in the lower atmosphere. That dust also contributes to this effect. And that’s why, here in the desert Southwest, we enjoy some of the most beautiful sunsets on the planet. Smog, or smoke from wildfires, can do the same thing, but sometimes produce weird colors like blue and green. Note that the traditional Blue Moon is totally different phenomenon.